Livogen is the brand name of two active ingredients along with some non active ingredients. 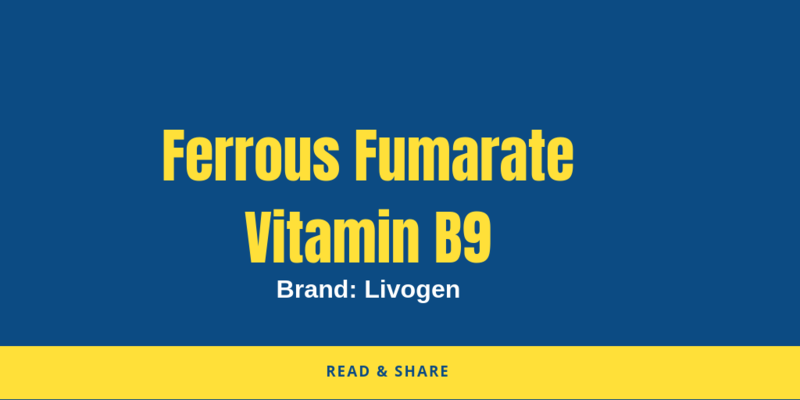 The active ingredients present in this formulation are Ferrous Fumarate and Folic Acid. Livogen Tablet is mainly used for the treatment of anemia and deficiency of folic acid. It is also used as a supplemental medication for diseases which cause a deficiency of iron and folic acid in the body. It is also used in other conditions. See below Uses. It works by acting on the bone marrow to produce a normoblastic marrow and promotes the production of blood cells in the body. Other conditions for which livogeni are prescribed as an additional drug include low levels of red blood cells or hemoglobin, infantile anemia and megaloblastic anemia. It Helps to supply sufficient Elemental Iron or Ferrous Fumarate, which helps in regulating the oxygen supply through RBC to various parts of the body. The Livogen tablet should only be taken with a doctor’s prescription. Your doctor may prescribe different options depending on your health, age and needs. People with anemia due to vitamin B12 deficiency (pernicious anemia). Hereditary disease that causes too much iron accumulation in the tissue (hemochromatosis). People with anemia due to folic acid deficiency. People with a disorder that affects the iron in the body (hemosiderosis). urine during the night (paroxysmal nocturnal hemoglobinuria). People with other diseases that affect hemoglobin, such as sickle cell disease or thalassemia. People receive repeated blood transfusions. Inflammatory bowel disease such as ulcerative colitis or Crohn’s disease. This medicine is safe during pregnancy. However, you should ask your doctor or midwife if you need to take iron and folic acid supplements during pregnancy. All pregnant women should not take supplements; Your diet may contain enough nutrients. No known harmful effects when this medication is used by nursing mothers. Zinc and calcium supplements reduce the absorption of iron supplements. Separate the drugs for at least two hours. Trientene, used to treat Wilson’s disease, also reduces the absorption of iron supplements from the intestine, making them less effective unless the doses are separated by at least two hours. Magnesium carbonate, magnesium hydroxide, aluminum hydroxide and calcium carbonate, can reduce the absorption of iron by the intestine and make the less effective supplements. Separate the drugs for at least two hours. Folic acid can reduce the blood levels of the anti-epileptic drugs phenobarbital, phenytoin and primidone. If you take folic acid in combination with any of these anti-epileptic drugs, your doctor may need to increase the dose of this antiepileptic to keep the seizures under control. Milk, milk-based products, tea, coffee and eggs can reduce the absorption of iron from the intestine, while vitamin C (ascorbic acid) increases it. The dose of this drug depend on your medical condition. Your doctor will decide the amount of dose. However it is recommended to be taken empty stomach, at least one hour before or two hours after a meal. Along with the dosage recommended for this medicine. it is very important to follow the diet plan recommended by the doctor or healthcare provider to facilitate better absorption of the medicine. Consume enough iron-rich foods in order to get maximum iron from natural food sources. Livogen is a multivitamin supplement composed of ferrous fumarate and and folic acid (Vitamin B9). It is used in different conditions. check it above in Uses Section. 2. What is the use of Livogen? Livogen is a supplemental product mainly used for anemia, pregnancy, low RBC or hemoglobin count, lack of iron and vitamin B9 supply in diet, childhood anemia, Megaloblastic anemia. and other conditions. 3. What are the side effects of Livogen? The most common side effects associated with the use of this drug are nausea, constipation, allergic reactions, flatulence, Dark or green stools, and dark urine. There are other side effects check above “Side effects”. 4. Can I take Livogen on an empty stomach? Take with food if this medicine cause stomach upset. Ask your pharmacist before using. 5. What happens if i Overdose Livogen? Taking more than prescribed Livogen Tablet may cause harmful side effects. Consult your doctor if you suffer any kind of side effects. 6. What happens if i Miss a dose of Livogen? If missed certain regular dose, take as earliest possible, and if it is time for the next dosage, then skip the missed dose and carry on with next regular dose. Never use extra doses. 7. What if I take an expired dose of livogen? A single expired dose of livogen can not cause major side effects. However, expired medications lose their effectiveness and may not be effective. Check the drug package to confirm the expiry date of Livogen Tablet. 8. How should I take Livogen? Use exactly the instructions and prescription of your doctor. Do not use in larger or smaller amounts or longer than recommended. It is best to take this medicine on an empty stomach, between meals or at bedtime. 9. Is the use of Livogen Tablet safe during pregnancy? This medicine is safe during pregnancy. However, you should ask your doctor or midwife if you should take iron supplements and folic acid during pregnancy. All pregnant women should not take supplements; Your diet can contain enough nutrients. 10. Is Livogen Tablet safe while breastfeeding? No known harmful effects if this medication is used by nursing mothers. It is best to ask your doctor before taking any medicine for breastfeeding. 11. How to store livogens? This medicine should be stored at room temperature, away from direct sunlight and heat. Keep the Livogen tablet out of the reach of children and pets. The ideal storage temperature for this drug is below 25 degrees Celsius. 12. Can i drive after taking Livogen Tablet? If drowsiness, dizziness, hypotension, or headache are side effects of using Livogen Tablet, it can be dangerous to drive a vehicle or use heavy machinery. You should not drive if the medication makes you sleepy, stuns you or lowers your blood pressure. 13. Is Livogen cause addiction? Habit forming tendencies for this drug has not been reported. 14 Does Livogen cause Black stool? Dark colour stool and dark urine are among the most common side effects of using this medicine. However this is not harmful.